Expert facilitation for the first two Summits was provided by The Future Search Network, a non-profit agency that supports stakeholders from diverse, and often opposing, viewpoints to untangle complex social, economic, technological, and environmental issues and challenges. 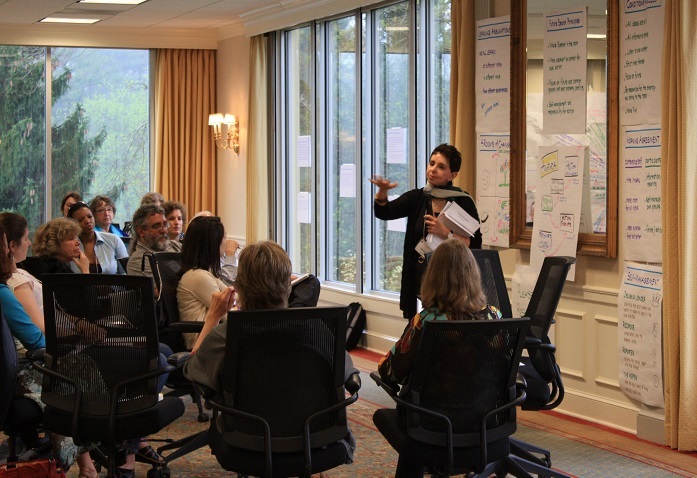 A Future Search Network Conference, developed by Marvin Weisbord and Sandra Janoff, is a structured two and a half day meeting, based on a set of principles that maximizes the capacity of meeting participants to engage in cooperative action for the common good. The Network has led numerous conferences for communities, schools, hospitals, and non-profits and has a notable track record in Africa, Asia, Australia, Europe, India, and North and South America. Future Search is internationally known for brokering lasting agreements and shared initiatives in highly volatile and polarized settings, around a variety of issues related to poverty, health care access, regional and ethnic conflict, and education. Future Search conferences have led to years of ongoing collaboration, beyond what people expect from a single meeting. In the US, Future Search has also worked with numerous public health agencies including the Center for Disease Control and INOVA Health Systems, health care providers, health care administrators, and communities across the United States to address issues of health inequality. These projects have included initiatives to reform welfare policy and to reduce infant mortality in disadvantaged regions, to reduce economic, racial, and ethnic disparities in health care, and redesign of the patient care process, policy, and local practice around hospital/community collaboration. Sandra Janoff PhD co-developed the principle-based methodology called Future Search, a process used world-wide to get the “whole system” focusing on the future and creating values-based action strategies. She has supported many health-focused initiatives including: INOVA Health Systems in a system-wide redesign of patient care; Woman’s Hospital in Baton Rouge, LA to build a strategic direction; Center for Disease Control to create policy and local practice around hospital/community collaboration; Ko’olau Loa District, a rural community in Oahu, Hawaii to build a healthy community and reconnect to traditional values, followed a strategy for the future at Kahuku Hospital, the local hospital. Sandra’s international work includes: UNICEF’s Operation Life-Line Sudan and UNICEF, Indonesia. She was involved in an initiative to create a future for the children of Southern Sudan during the North/South Civil War. One outcome was a follow-up effort to demobilize child soldiers resulting in 13,000 young boys going back to their homes. In Indonesia, she ran a Future Search to create region-based education policy and practice across the country. Sandra’s most recent work is a national initiative to end violence against children in schools across Uganda. Additionally, her work in Northern Ireland, during and after the sectarian violence, enabled County Fermanagh and the cities of Derry-Londonderry, Strabane and Coleraine to create community-led integrated economic development plans. Sandra also consults with international corporations, communities, and non-profits on issues of sustainability, globalization and social change. She and Marvin Weisbord co-direct Future Search Network, an international service organization formed to bring their work to communities around the world. Sandra has a Ph.D. in psychology from Temple University, Philadelphia, PA. Sandra is co-author of Future Search: An Action Guide to Finding Common Ground in Organizations and Communities, (Berrett-Koehler, May, 3rd ed, 2010) and Don’t Just Do Something, Stand There! Ten Principles for Leading Meetings that Matter (Berrett-Koehler, 2007). Sarah Balthaser has been on staff with the Community Outreach Program at the Department of Veteran Affairs Medical Center, Pittsburgh PA, USA. She organized programs for Veteran’s health education and facilitated Veteran reentry in the areas of healthcare benefits and employment opportunities. She has worked with the Jewish Healthcare Foundation, a non-profit organization that provides free healthcare to the underserved community. Her particular emphasis was on improving health literacy. Her work at the Maternity Care Coalition in Philadelphia PA was in HIV Prevention. Sarah has co-facilitated Future Search to address the following issues: Reducing child poverty in a neighborhood of Rochester, NY called the Rochester Children’s Zone; Preventing Violence against Women and Children in Uganda; Finding a Future for Children and Adults in the Karamoja Region of Uganda.